Abstract: Random Access Memory (RAM) can be thought of as the short-term memory, in the sense that once the power is turned off, all information stored there is not saved. Modern computer processors can perform several billion operations per second, creating and changing incredible amounts of data in a short period of time. To perform at this level, they have to be able to juggle the information they process, to have someplace to store it until it is needed again for modification or reference. As a metaphor, the more jobs a technician takes on at once, the more bench space they are going to need to place the components they are assembling, and the more shelf space they will need to place the finished products. Similarly, computers need space to store data while they are working on it, and space to store data that is not being worked on, but will be needed in the future. This is provided by RAM (Random Access Memory) and hard disk drives respectively. Computers have a memory structure which can be easily (if somewhat sloppily) compared to the human brain. The hard drive provides long-term memory storage similar to our long-term memories, a place where data is put to be permanently stored. 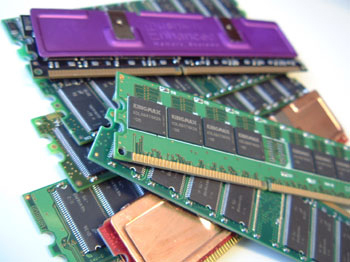 RAM (Random Access Memory) provides a pallet that the computer can work from in normal operation, similar to our short-term memory. It holds information that is essential now but may or may not be transferred to long-term memory, depending on need. Modern processors also include a memory cache, a comparatively small amount of high-speed memory which stores the data that is currently being used most often. This could be compared to our awareness, the memory that connects one moment to the next and keeps us doing what we were doing a second ago. Random Access Memory (RAM) can be thought of as the short-term memory, in the sense that once the power is turned off, all information stored there is not saved. All modern computers have hard drives which store data permanently as magnetic information, but even with the improved speed of today's hard drive technology. Hard drives are still too slow to keep up with the needs of the processor since it can operate on considerably more information per second than can possibly be transferred to and from the hard drive. This is where the need for a fast, short-term memory solution comes in, a memory space that provides very fast access for the processor so data can be written and read as needed without slowing down the system appreciably. RAM fulfills this need, specifically DRAM (Dynamic RAM), the template for all modern memory types. DRAM consists of semiconductor chips arranged on a small circuit board, each containing a logical arrangement of cells laid out in rows and columns. These cells use a combination of a capacitor and a transistor to achieve one of two states, filled with electrons (1) or empty (0), thus allowing binary (digital) information to be stored. The dynamic aspect of this type of memory is that it needs to be constantly refreshed with an electric charge to keep its information stored. When the computer is turned off, all data in the DRAM is lost. In all modern desktop computers, DRAM can be added directly to the motherboard in the form of memory modules, a circuit board with mounted memory DRAM chips. There are three main types of memory in common use today. SDRAM (Synchronous Dynamic RAM), DDR-SDRAM (Double Data Rate SDRAM) and RDRAM (RAMBUS Dynamic RAM). This article will detail all three, though it should be mentioned at this time that DDR-SDRAM in its various forms is by far the dominant type in today's PC market. Pg 5. What type of memory should you use?